A Disney cast member scans a park pass with an iPod touch. Photo by Alexandra Hughes. Visitors to the Magic Kingdom in Central Florida will notice that Disney has begun to eliminate old-fashioned turnstiles at the park's entrance. 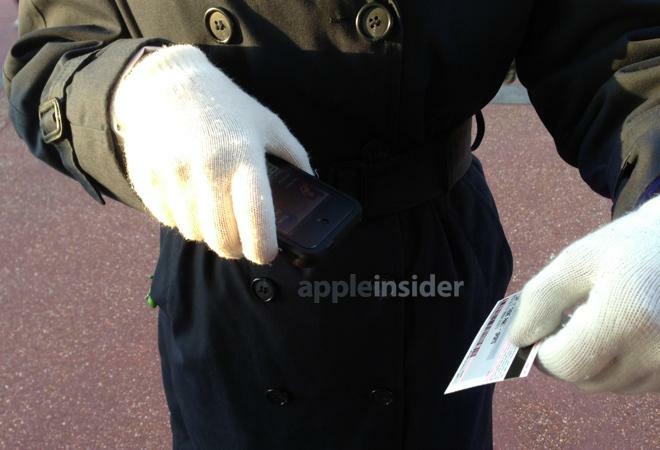 Instead, some visitors are greeted by the company's "cast members," holding iPod touches in their white-gloved hands. The change is part of a larger initiative by Disney known as "MyMagic+," which has the ultimate goal of making the company's theme parks even more convenient and inviting for those who visit. Disney's cast members have been equipped with Apple iPod touches as part of a test to more easily provide services to guests. A Disney representative who spoke with AppleInsider noted that because the program is in a trial stage, there's no guarantee that the company will ultimately adopt the iPod touch as a long-term catch-all connected solution for its cast members. But for now, cast members are utilizing Apple's iOS device with a special accessory case and accompanying software that allow passes to be scanned and information to be quickly accessed if a visitor needs assistance. Disney's Magic Kingdom is the most visited theme park in the world, having hosted 17 million visitors in 2011. It's the centerpiece of the Walt Disney World Resort located near Orlando, Fla.
Officials hope the changes at the Magic Kingdom make it a more welcoming visit: Instead of structures that block people from entering, visitors are simply greeted by a Disney cast member as they walk into the park. Eventually, all guest tickets will be radio-frequency enabled to further expedite the process. The new ticketing system means that a full family with two strollers and two adults can now go through at the same time  something that was impossible before. Disney's use of the iPod touch at its Central Florida resort is similar to what Apple has done at its retail stores, where checkout counters and cash registers are a thing of the past. Instead, employees at Apple's own stores are also equipped with iPod touches that can be used to finalize a purchase and scan a customer's credit card. A closer look at Disney's iPod touch ticketing system. At the Walt Disney World resort, 50 percent of the previous turnstiles at Disney's parks remain in place, while the other 50 percent were converted to use RFID. 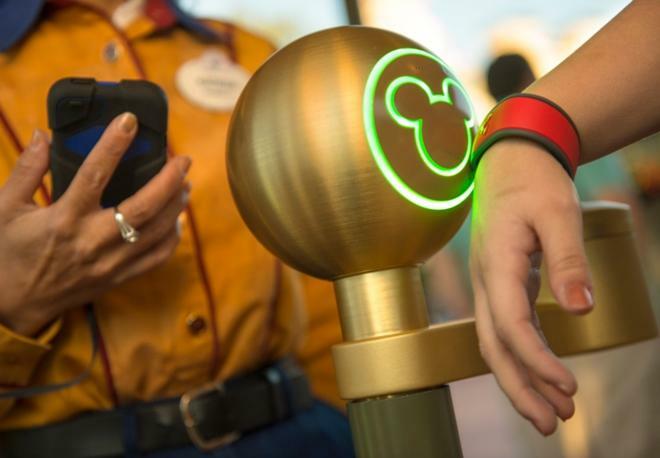 As the MyMagic+ plan expands, Disney plans to provide customers RFID wrist bands  known as the "MagicBand"  that will do it all, acting as a visitor's hotel key, park pass, Fastpass card, and even a way to authorize transactions tied to a credit card. The company's plans were detailed by Tom Staggs, chairman of Walt Disney Parks and Resorts in January, when he noted that his company has "devoted considerable time and resources to create a more immersive, more seamless and more personal experience" for guests. The Magic Kingdom is the most visited theme park in the world, having hosted 17 million guests in 2011 alone. "This collection of tools is another step forward in the ongoing evolution of our guest experience, giving us even more ways to help friends and family create the unforgettable Disney memories that they want most," Staggs said. Other crucial parts of Disney's changes also rely on iOS. Last year, it was revealed that the iPad was being used as part of a test pilot for Fastpass ride ticketing at the Magic Kingdom. There's also the official My Disney Experience application for iPhone and iPad, which offers Walt Disney World maps, official Disney Parks-provided wait times, Fastpass return times, and the ability to view menus and book dining reservations. 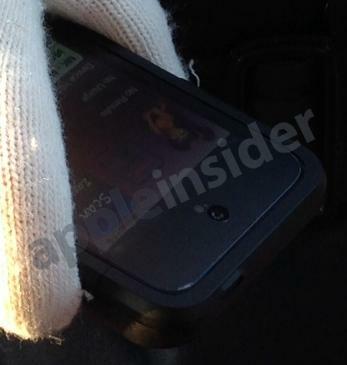 An iPod touch is shown being used as part of Disney's forthcoming Magic Band service. Disney has plans to continue to roll out its revamped ticketing system at other Central Florida parks, and potentially at its other destinations around the world. However, the company told AppleInsider that because all of its parks are different, the program will not look exactly the same at each location. The changes are part of a larger initiative at Disney known as "MyMagic+," which will eventually employ an RFID-equipped wrist band known as the "MagicBand." The ultimate goal, the company said, is to make the experience more seamless, and to allow Disney cast members to more easily focus on the needs of visitors. Rather than requiring customers to go to a guest service window, as they have done in the past, someone in the park with an iPad or iPod touch would instead help that person on the spot. Disney's embrace of Apple products is not new, as the two companies have had a close relationship for years, driven by the fact that Apple co-founder Steve Jobs also helped to found the movie studio Pixar Animation Studios, responsible for Disney's blockbuster franchises such as "Toy Story." When Pixar was bought out by Disney, Jobs became the largest shareholder of Disney stock. Disney CEO Bob Iger also joined the Apple Board of Directors in late 2011. Iger worked closely with Jobs to bring Disney's content to iTunes, at a time when other studios hesitated to ink a deal with Apple. Disney also turned to Jobs in 2009 in an effort to overhaul its own retail stores located in the U.S. and Europe. At the time, Jobs told Disney executives to "dream bigger," and provided access to proprietary information about how Apple has developed and operated its own highly successful retail operations. Like at Walt Disney World, the changes prompted Disney to utilize iPod touches for mobile checkout.